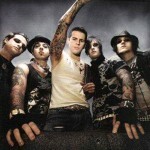 Avenged Sevenfold is an American heavy metal band from Huntington Beach, California. Formed in 1999, the group consists of vocalist M. Shadows, lead guitarist Synyster Gates, rhythm guitarist Zacky Vengeance, bassist Johnny Christ. They are known for their diverse heavy metal sound, dramatic imagery in album covers and t-shirts.Avenged Sevenfold emerged with a metalcore sound on their debut Sounding the Seventh Trumpet but their style had evolved by their third album and first major label release, City of Evil into a hard rock/heavy metal sound. The band continued to explore new sounds with their self-titled release and enjoyed continued mainstream success before their drummer, James "The Rev" Sullivan, died in 2009. Despite his death, the band continued on with help of now-former Dream Theater drummer Mike Portnoy and released and toured in support of their fifth album Nightmare in 2010 which debuted on the top spot of the Billboard 200, their first number one debut.